Genre: Action Publisher: Sony Interactive Entertainment Inc.
“ASTROBOT：RESCUE MISSION” is a brand new Platform game exclusive to PlayStation®VR. Take control of ASTRO the captain BOT and go on an epic VR rescue mission to save your lost crew who got scattered all over 5 planets. 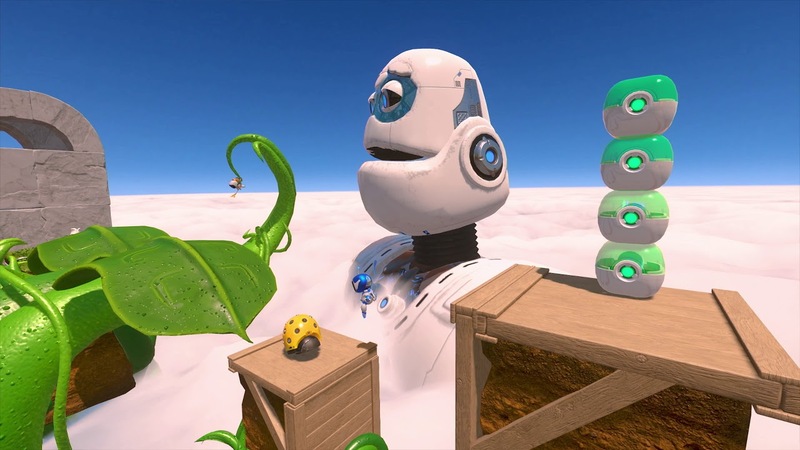 The game takes full advantage of PS VR to reinvent the platforming genre with gameplay unfolding around you in 360 degrees. In VR, every jump can be judged with perfect accuracy. It’s not just about character control. You will have to use your body to smash parts of the environment, dodge enemy attacks coming at you, and lean around corners to discover new areas. 20 unique levels await you in 5 planets, each one populated by deadly traps and enemies blocking your way. You will go through a city, dark caves, lush forests, heavenly beaches, a volcano and even inside the belly of a gigantic whale. Huge bosses await you at the end of each world and you will need to use all your skills to get past them. Defeating each one will allow you to retrieve one of the missing pieces of your spaceship. Your DUALSHOCK®4 wireless controller becomes the host of a bunch of fun gadgets ranging from a hook shot used to cross ravines, water cannon, slingshots and even deadly ninja stars to cut through enemies.